Not a day goes by when we don’t get a message from someone frustrated because they tried to use their miles for a “free” flight, and were stymied by hundreds of dollars in taxes and fees. While some airports and countries do have higher fees, the bulk of these costs are almost always due to carrier-imposed surcharges, or fuel surcharges. But what are fuel surcharges, how do you figure out what they should be, and how can they be avoided on award tickets? Now let’s get into the details — and there are a lot of details. I’ll explain a bit of the background behind these pesky fees, go over how to determine what the surcharges are on a ticket, and most importantly — how to avoid them when using miles and points. Why do airlines impose fuel surcharges? 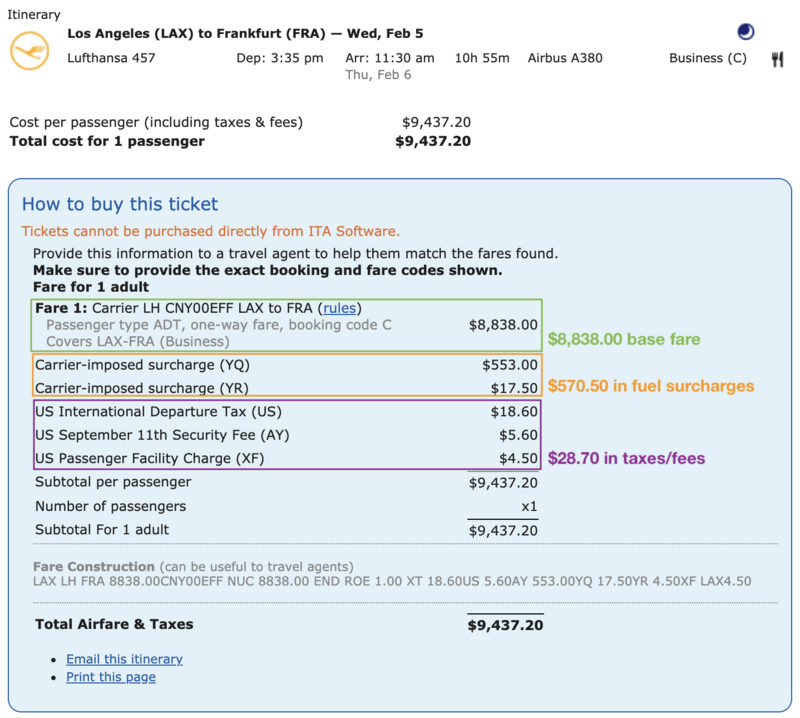 Why do airlines keep surcharges separate from the fare? Why should you care about fuel surcharges? In theory, these are the additional costs required to fuel the airplane. Or something. Now, you might ask why “fuel surcharges” aren’t just bundled in to the fare, given that companies should ostensibly be charging an appropriate price for their goods and services already, and commercial airplanes need jet fuel in order to provide the most fundamental aspect of their service — flying. It’s like a sandwich shop charging extra for bread, despite that being what makes it a sandwich, versus a salad or something. And I’m pretty sure you don’t often go to a swimming pool and find out there’s a separate charge for filling the pool with water. So I don’t understand how a modern transportation provider gets away with claiming that the price of providing said transportation somehow shouldn’t include the costs of all the components required to make that mode of transportation actually function. Granted, the real price of airfare rarely reflects the actual cost of providing air service, and there are many more complicated factors that go into airline pricing. But suggesting you need a supplemental fee for basic operations, when your pricing is already arbitrary…well. Bottom line up front — it’s because they can. Once upon a time, the cost of oil (and thus jet fuel) skyrocketed, catching many airlines unaware during an already difficult economic period. Many carriers adjusted by adding a “fuel surcharge” — something that could easily and systematically be added to all fares in a market without having to recalculate the cost of every seat on every flight on every route. The insinuation was that these were a temporary fix to market conditions, not necessarily a fare increase. Of course, without regulation requiring these surcharges to be pegged to the cost of fuel, the surcharges stayed in place long after the price of oil plummeted, and continue to increase disproportionately to the price of fuel. Eventually some governments intervened, there were also some lawsuits, and in those markets airlines are no longer allowed to call these “fuel” surcharges, given that they aren’t actually tied to the price of jet fuel. Instead, you may see them listed as “carrier-imposed surcharges,” which is at least more honest. Fundamentally, the mechanism that allows airlines to impose fuel surcharges is darn convenient from a systems perspective. Rather than re-faring hundreds of flights and fare codes, someone in revenue management can go in and simply increase the surcharge on all routes from a particular region. Similarly, airlines can offer discounts to corporate accounts on the base fare, and then still levy whatever surcharges they want/need to on the full ticket, without renegotiating contracts. Most of the time, you don’t need to. Revenue fares are displayed “all-in” in most countries, and if you’re purchasing a ticket the various fees and surcharges are already included in the price. So unless you’re a corporate travel manager evaluating whether or not a proposed contract discount is actually worthwhile, or the staff of some government agency investigating whether or not these surcharges constitute deceptive and misleading business practices in your local jurisdiction, there’s really no reason to be looking at the fees breakdown on every airline ticket you purchase. You’re still going to pay them. When you’re considering using points or redeeming miles, however, that’s when it’s helpful to know the breakdown of the taxes and carrier-imposed fees. 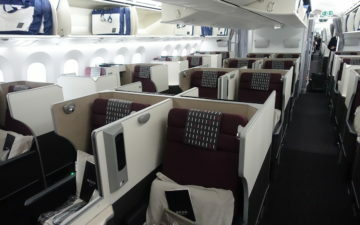 That’s because you’ll usually pay these costs in addition to the miles or points required for the award. To give an example of the first exception, let’s look at a British Airways Avios award between London and Amsterdam. This is a route where BA offers “Reward Flight Saver” fares — meaning British Airways charges a flat rate for all the taxes and fees, rather than whatever they would actually be. These fares are identified by the little blue badge above the flight number, and can sometimes be a very good deal. London to Amsterdam is a short flight, so during off-peak dates it’s only 4,000 Avios. The standard “Reward Flight Saver” fees are ~$27.50, so if you value Avios at ~1.3¢ each like we do, that’s ~$79.50 all-in. Even without factoring in the miles you’d earn (which also gets complicated), it may not make sense to spend 4,000 Avios to save ~$33. But of course your valuations could be different, and fares won’t always be this similar, so I think it’s helpful to know how to evaluate the options. The specifics of these laws obviously vary from country to country. In most cases they only impact flights from a country, while in others they restrict inbound fares as well. And just because there is regulation doesn’t mean there aren’t surcharges — just that airlines don’t have free rein in how they are implemented or marketed. So if you’re traveling to, from, or through one of these countries — especially on an award ticket — you’ll want to pay attention to the surcharges. They could vary based on how your ticket is structured. While you could look at the cost of a revenue ticket and subtract the fees associated with an award like we just did, that doesn’t give you the full breakdown of what types of taxes and fees you’re actually paying. And not all carriers display their award fees online, which puts you at a bit of a disadvantage as a consumer. As with everything involved in redeeming miles, the more informed you are about what the fuel surcharges and fees should be, the better you’ll be able to avoid overpaying if the fare was somehow stored incorrectly. So, here’s how you can pull up your own breakdown of the fees associated with your airline ticket. 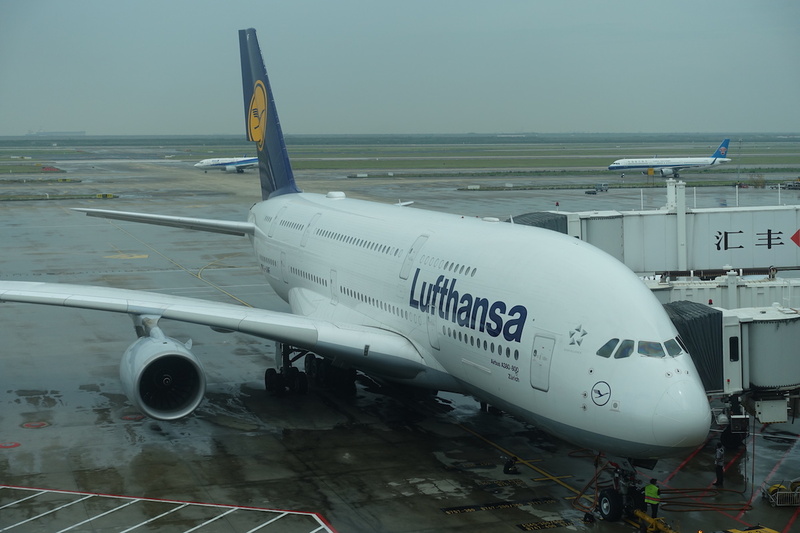 Let’s use a Lufthansa business class ticket from Los Angeles to Frankfurt and back as an example. To start off, I like to use Google’s ITA Matrix to pull up the flights. The tool is free (though searches take more time than they used to), and it’s pretty simple to use once you know what to do. Otherwise, you’ll see more results here, and can choose the relevant flight combination. From there, you can click on your desired flight to get a breakdown of the fare. Fundamentally, what I like about ITA is that they make it pretty simple to see all the details of an airline fare. If you look at the bottom of the screen you’ll see the formal fare construction, which at first glance is a bunch of gobbledegook. On closer inspection you’ll see that most of the letter codes and all the numeric amounts are listed out nicely up above, which makes it easier to see what is going on. 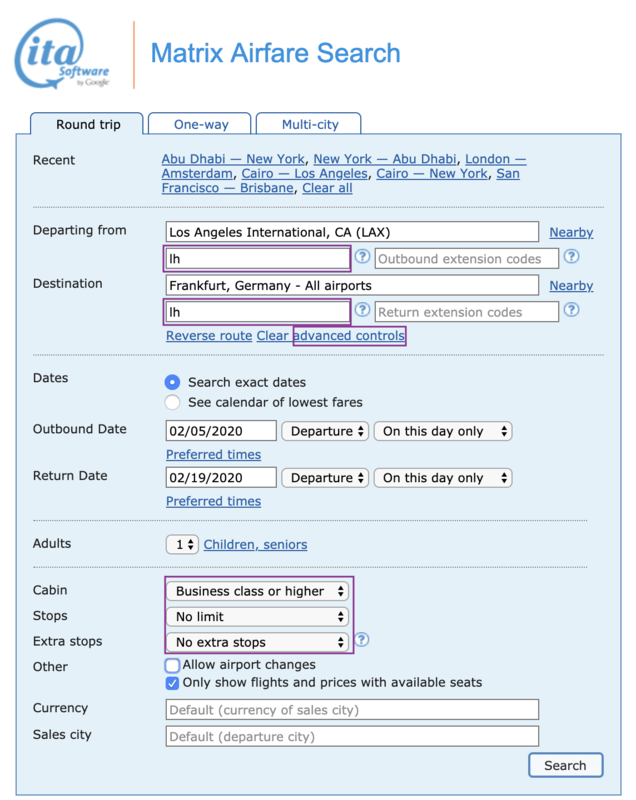 For this ticket, you can see that there are two base fares — the price for flying from Los Angeles (LAX) to Frankfurt (FRA), and back adds up to $3840. Then the pesky fuel surcharges are listed out as both YQ and YR — you don’t need to know why a carrier would use one or the other (or both), just that those are the codes used. In this case, those add up to $1,123.50 in fuel surcharges. Yikes. Fortunately you don’t have to pay these on many award tickets, which we’ll get into later. Everything that is left makes up the assortment of government and airport taxes and fees. In some cases these are flat per-passenger fees, while others are determined as a percentage of the base fare, or influenced by the class of service. These are the total fees you have to pay regardless of whether it’s an award ticket or a revenue ticket — $159.03 in this case. Whether you want to add up the components that are relevant to your situation, or subtract out the ones that aren’t depends on how your brain works. I usually take the subtotal, then subtract the base fares, then subtract the fuel surcharges if not applicable — but addition in reverse works too. Once you get into the habit of looking up fares and separating out the base fares and taxes from the YR and YQ fuel surcharges, this goes pretty quickly, and provides an interesting snapshot into how fares are broken down. There’s obviously some logic overlap between origination country and one-ways versus round-trips, but let’s look at how our Lufthansa trip would price if we booked two one-ways rather than a round-trip. Booking these tickets separately would equal ~$842 in fuel surcharges, versus ~$1120 if booked as a round trip. 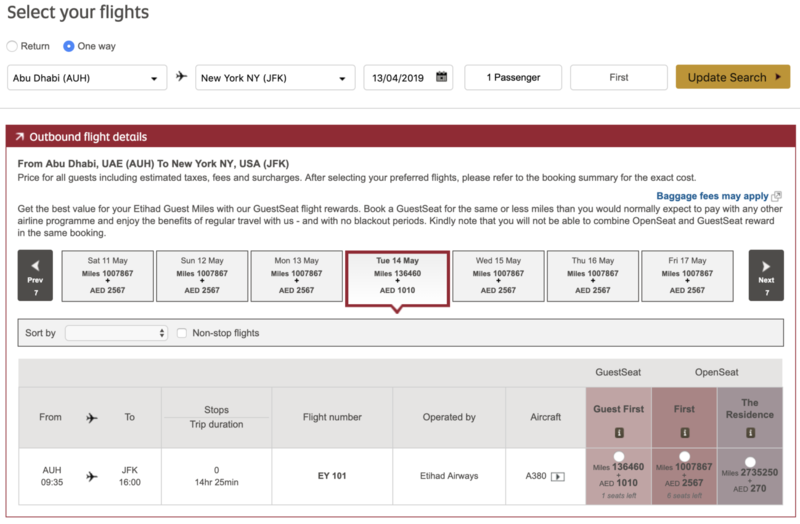 This is why if you’re booking award travel through a program that levies fuel surcharges, it often makes sense to book two one-ways, rather than a round-trip. You can save hundreds of dollars per person! 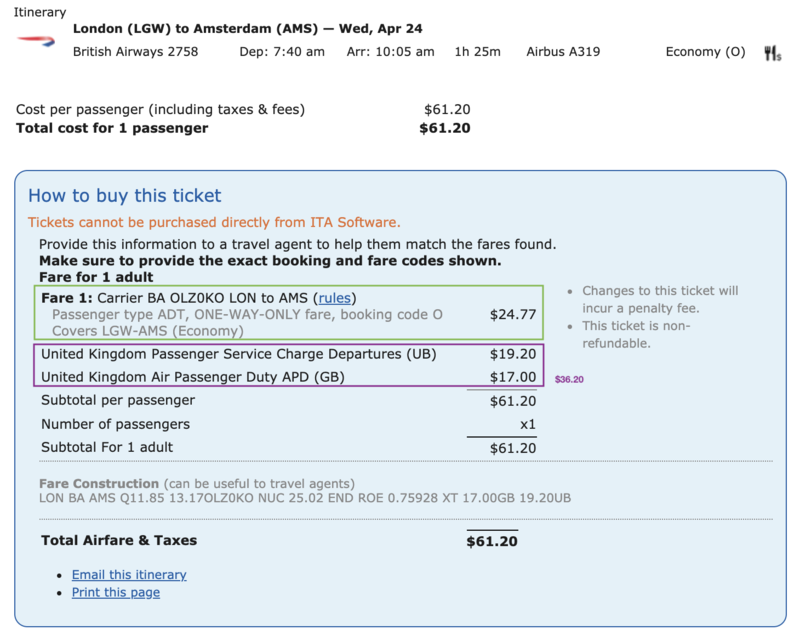 Going back to our earlier British Airways example from London to Amsterdam, we can apply the same approach to determine what the taxes, fees, and carrier-imposed surcharges would be if booking through another mileage program (or if this wasn’t a Reward Flight Saver) route. Looking at the breakdown, you can see that British Airways isn’t actually levying fuel surcharges on this flight. There’s a base fare of $24.77, and then $36.20 in UK taxes, but that’s it. 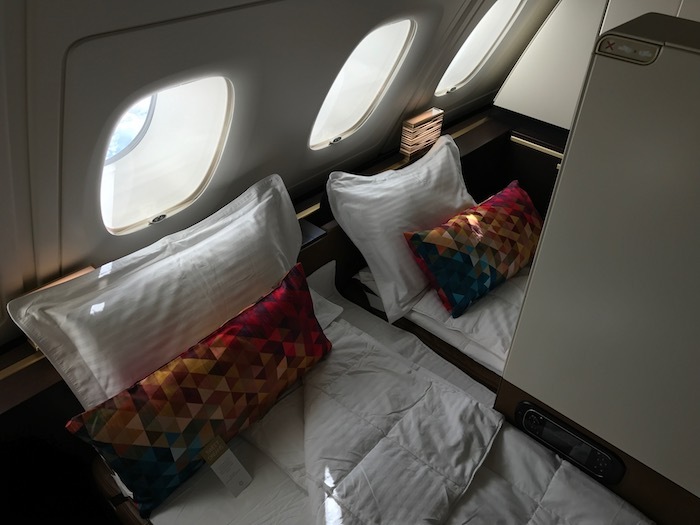 To give an example of a situation where the fuel surcharges in ITA aren’t a perfect match, let’s look at an Etihad first class fare. As you can see, in addition to the number of miles required for each award type being different, the fees are vastly different as well. The “Guest” space has AED 1010 of fees (~$275), and the “Open” space has AED 2567 (~$699). That’s a substantial difference. That roughly matches the fees being assessed on the “OpenSeat” award, or at least is close enough to be a rounding error, so that makes sense. 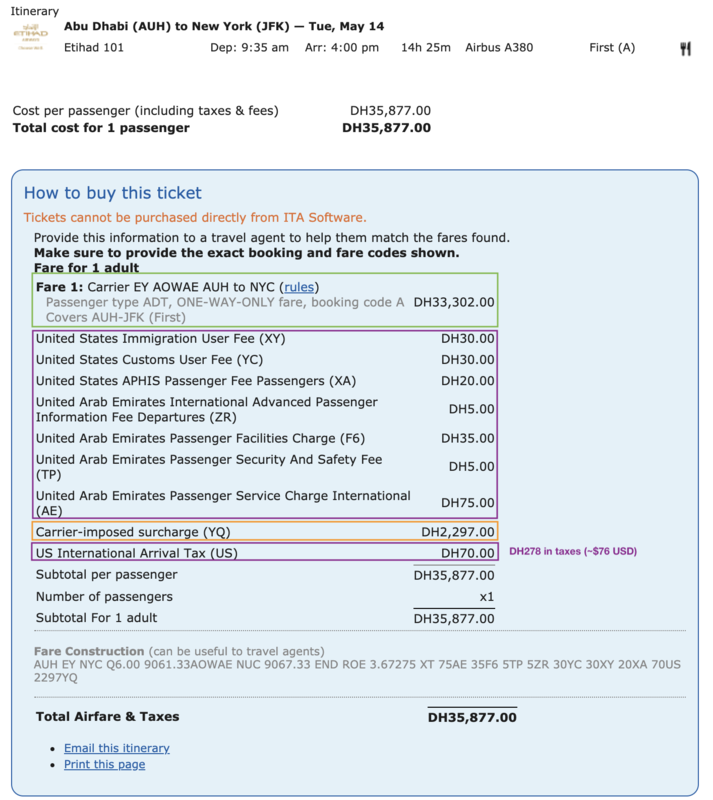 The actual taxes on the ticket are only AED 278 (~$76), so I have no idea where they are coming up with the fees on the “GuestSeat” award — most likely a private fare just for redemption purposes. The good news is that for the most part Etihad’s partners don’t pass along fuel surcharges, so if you’re booking through another carrier you’d just pay the actual taxes, and this wouldn’t be a factor. But it does give a good illustration of what could be going on when the taxes and fees are different than what ITA would suggest. With all that as a background (phew! thanks for sticking around! ), let’s talk about surcharges when it comes to using your miles and points. I can see the logic behind both tactics, though obviously disagree with the first approach on principle. The important thing is to know what programs pass on fuel surcharges, and which don’t, so you can plan your redemptions accordingly. I’ll go through the main programs below, but if there’s a loyalty program I didn’t list that you’re particularly interested in, just let me know in the comments and I’ll try and add them. Otherwise, pretty much all of the popular mileage programs have instances where they levy fuel surcharges (and of course that means there are times where they don’t!). Where this gets extra fun is when a partner program has a different philosophy than the airlines you’re actually flying. Programs handle this in different ways, which is interesting, because it seems like something that would be standardized, or at least consistent across partners, but that often isn’t the case. Air France and KLM add fuel surcharges to their own flights, and most partner flights (even when the partner themself wouldn’t necessarily have them), but doesn’t charge them on Delta flights within North America, or on Aeromexico or Xiamen Airlines. Iberia’s fuel surcharges are relatively mild, at least, and you won’t pay YQ if you’re including one of British Airways’ fifth-freedom flights in an AAdvantage award. Given that list, it’s fairly easy to find ways to redeem BA Avios without paying high fees to do so. Delta passes on most partner fuel surcharges these days when the operating carrier would have them too, though they’re mostly mild to Asia and South America, and especially in comparison to what you see in the other alliances. European flights are where the fees can add up, and Delta even adds fuel surcharges to their own flights when the award originates in Europe. Unlike other programs, I wouldn’t necessarily avoid travel on these carriers all together. The surcharges aren’t anything compared to Lufthansa and British Airways. If United is the transoceanic carrier, but you have segments on other partners, you’ll pay full YQ for the entire itinerary. It’s also worth mentioning that as New Zealand regulates fuel surcharges, itineraries that only have NZ flights should also have very low fuel (though not non-existent) surcharges. 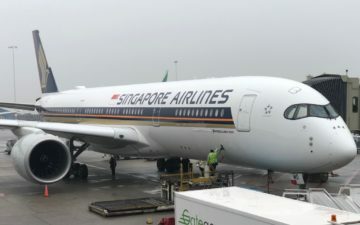 Singapore doesn’t have fuel surcharges on their flights, or on United flights, but adds them to all other partners. Fuel surcharges and carrier-imposed fees are a holdover from days when oil was shockingly expensive, and airlines had to make quick changes. Fortunately, these holdovers don’t have too much of an impact on revenue fares. 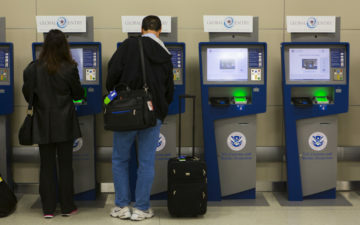 And when it comes to redeeming miles there are several ways to avoid paying these high fees, given nearly every program has some way of using miles without surcharges. Once you know the surcharges, you can determine which mileage program to book with, or even if it makes more sense to purchase a ticket. What other questions do you have about airline fuel surcharges? I skimmed this Tiffany, but it would probably be worth mentioning the art of fuel dumps even if not the main focus. As always, Tiffany is the best. Thank you! Hong Kong no longer regulates fuel surcharge, but airlines (in theory) have to display all-in prices. Therefore, Cathay Pacific actually imposes surcharges on most of their flights. If redeemed with BA Avios, BA passes on these charges. Little correction: you can add TAP Air Portugal to the airlines that Aeroplan doesn’t levy fuel surcharges on, whereas Air China recently *has* added fuel surcharges to Aeroplan bookings. So basically, airlines could instantly render all their miles useless if they lowered the base fare to $1 and put the rest of the fare in YQ. Nice. I love starting itineraries in Brazil, because it negates all fuel surcharges on the remainder of the itinerary. For example, GRU-LHR-JFK on BA has no fuel surcharges at all, even though BA would ordinarily charge massive fuel surcharges. But JFK-GRU-LHR-JFK would have massive surcharges. Interesting your list of ‘countries’ includes Hong Kong and Taiwan. You could call it the list of “jurisdictions” to avoid a can of worms. Most people don’t call Hong Kong and Taiwan a country given one is a special administrative region and one is the People’s Republic of China’s 23rd province. Content you don’t get on that “other” site anymore. Thanks for this! What about canceling tickets? Should you be refunded the fuel and other surcharges? I don’t believe airlines will do this unless you ask. My dad had an air Nz flight from Melbourne to Auckland that was like $59 base fair + $77 in taxes. He asked to change it but it had a $100 change fee. He cancelled the flight but got the fuel surcharges back. Considering it’s often a big chunk of the fare it should be something to keep in mind. @Paul I think only China doesn’t call them countries and only then call Taiwan a province. If I have to pass immigration traveling between HK/Taiwan and China, I’m calling them countries, not to mention their respective governments are vastly different. @Tiffany & Ben- Did you see that Avianca Brazil is bordering bankruptcy? They’ve been instructed to pay upfront their airport fees or they can’t fly. They paid for flights today out of GRU, no word on flights for tomorrow. Dicey situation down in Brazil. Would make a good article. Amazing article. Great work Tiffany. Filing this away for future award bookings as a reference. Thanks! I think the US should be listed as one of the countries that regulates fuel surcharges since I believe they’re not allowed on domestic tickets, because of the general rule for domestic tickets in the US that says that any fee which all passengers are required to pay must be lumped into the fare? That’s also part of why Spirit lets you book at the airport ticket counter for no fee … if they had a fee for that booking channel also, they would have to incorporate it into the fare. But as long as they have at least one channel where you don’t have to pay the booking fee, they’re allowed to charge it separately. Can Delta still redeem China Southern? Can you expand the section on good countries to originate from, to receive lower or no surcharges and their cost range involved vs others in the region? I only know of Philippines, Brazil having no fuel surcharges, while Hong Kong has a short time at zero (when Oil prices were really low during the short Oil crisis period a couple of years back), and Japan seems to limit the surcharges as well. @ Kevin — Thanks! We’ll try and keep it updated. I’m confused. 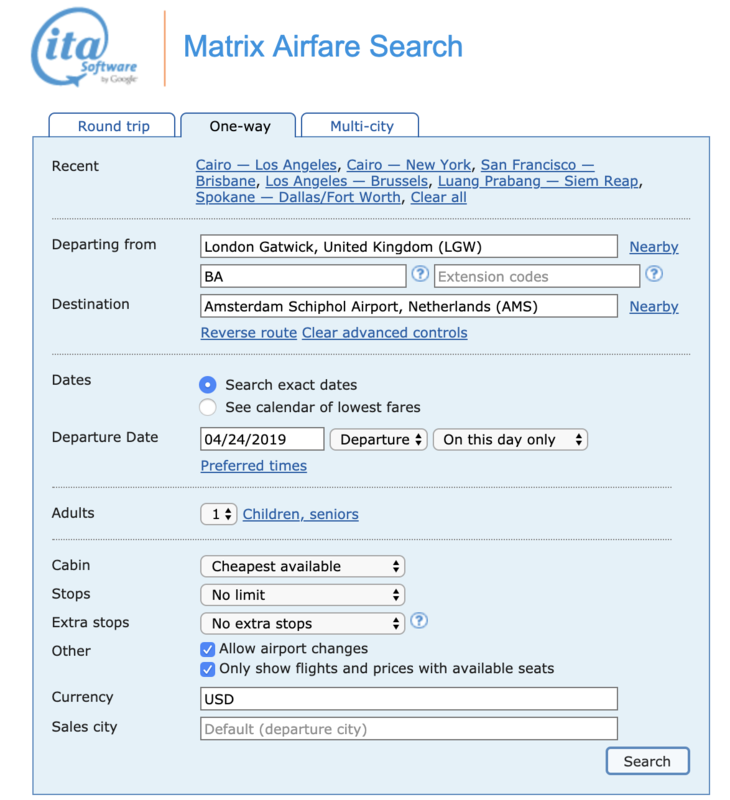 Why should we go through ITA matrix prior to booking awards to check surcharges? You would need to know availability and dates beforehand, which you would know only from searching on award website. Why not just try to book awards and see what the surcharge is? Your list Air Tahiti Nui under the Delta heading…articles I see about flying to Bora Bora always lament the inability to use miles to fly there from PPT. 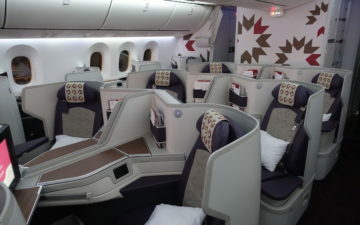 So is it possible to use Sky miles for award flights on Air Tahiti? 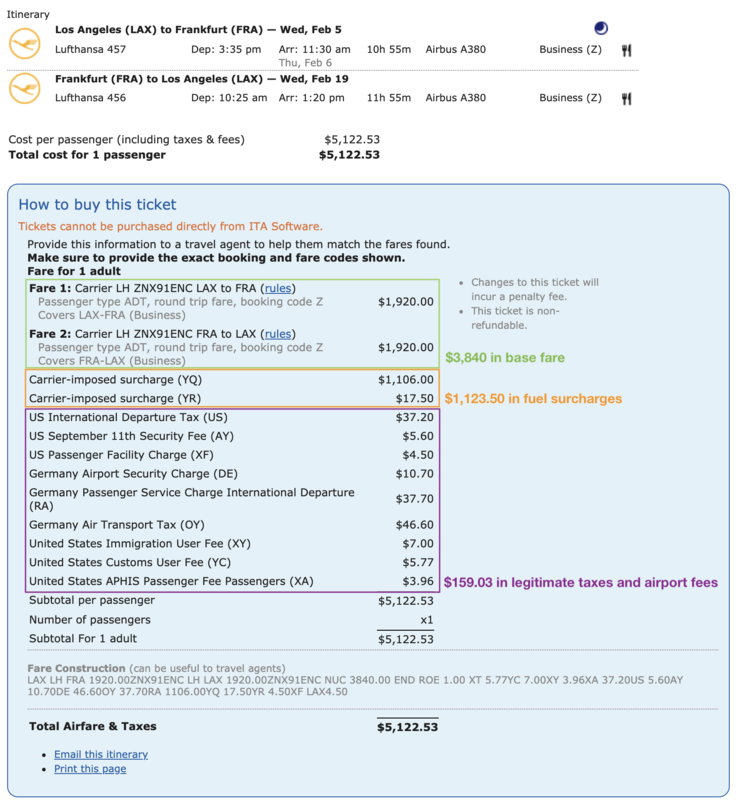 Lufthansa does not have surcharges on mileage tickets on Avianca for flights in Colombia. @ V — For the vast majority of awards out there, there are multiple programs to potentially book through, and knowing the surcharges impacts which program you might select. If you’re flying to/from Europe on Lufthansa, for example, you can use miles from any of the Star Alliance carriers. Some have very good mileage prices (e.g. Aeroplan) others have no surcharges (e.g. United). Depending on the route and how you value miles, surcharges could impact your decision. Beyond that, in many cases, the airline websites still don’t display all partners or full itineraries and fees, and calling a half-dozen different carriers to determine what the fees would be isn’t anyone’s idea of a good time. From an accrual perspective, if you have a trip in mind you can always get a sense of the surcharges by looking at a future date — they’re generally roughly the same for a given carrier and route. @ OR97 — Nope, unfortunately those are totally separate airlines. The best way to not go out of pocket on Air Tahiti flights is to use something like the Capital One Venture/Spark or Barclaycard Arrival that lets you redeem against your statement. Doesn’t cx levy heavy on qr as well? Thought i saw this before.. Very thorough article and I appreciate it. But let’s just not call them “fuel” surcharges. As you indicated they are not connected to the price of fuel, and that term must in some subtle way deflect from the general scam they are. Would be useful to outline Qantas’ fuel and other surcharges for award tickets. They vary wildly, but they have taken more than a few cues from their former BFF, British Airlines. Hi Tiffany! Excellent article! Any chance you could add the Emirates and Qatar programs there, as I have lots of points with them? The airline imposed surcharges are often related to the flag country for the airline and the original / destination of the flight. IE: A flight NYC > LHR RT on United may not have a carrier imposed surcharge. (In part because regulations in their flag country don’t permit them or limit them severely.) Other times you may get a carrier imposed surcharge if your Passport is not the same as the flag country for the airline. This rolls up to having to do background checks before they issue the award miles and needing the clearance done expedited. Yes, I have seen both of these scenarios. Finally, if you carry 2 passports I strongly suggest you avoid providing both passports to the airline. For the same reason, if your passport is on certain countries the surcharges may be more or less than for other countries. BUT, if you have 2 passports then you will almost always get the higher surcharge. Another reason airlines do this is that the fees they pay are based on ticket price. Dumping a large portion of the price to YQ also drops their fees and increases profits. Tickets are taxed based on fares. So, it’s in the airline’s best interest to retain as much profilts by lowering the fare basis and shift everyting to the fuel surcharge (YQ). Simple, deceptive and basic accounting methods… and yet very effective.